Mathematical gauge theory studies connections on principal bundles, or, more precisely, the solution spaces of certain partial differential equations for such connections. Historically, these equations have come from mathematical physics, and play an important role in the description of the electo-weak and strong nuclear forces. Gauge theory as a tool for studying topological properties of four-manifolds was pioneered by the fundamental work of Simon Donaldson in the early 1980's, and was revolutionized by the introduction of the Seiberg—Witten equations in the mid-1990's. Since the birth of the subject, it has retained its close connection with symplectic topology. The analogy between these two fields of study was further underscored by Andreas Floer's construction of an infinite—dimensional variant of Morse theory which applies in two a priori different contexts: either to define symplectic invariants for pairs of Lagrangian submanifolds of a symplectic manifold, or to define topological invariants for three—manifolds, which fit into a framework for calculating invariants for smooth four-manifolds. 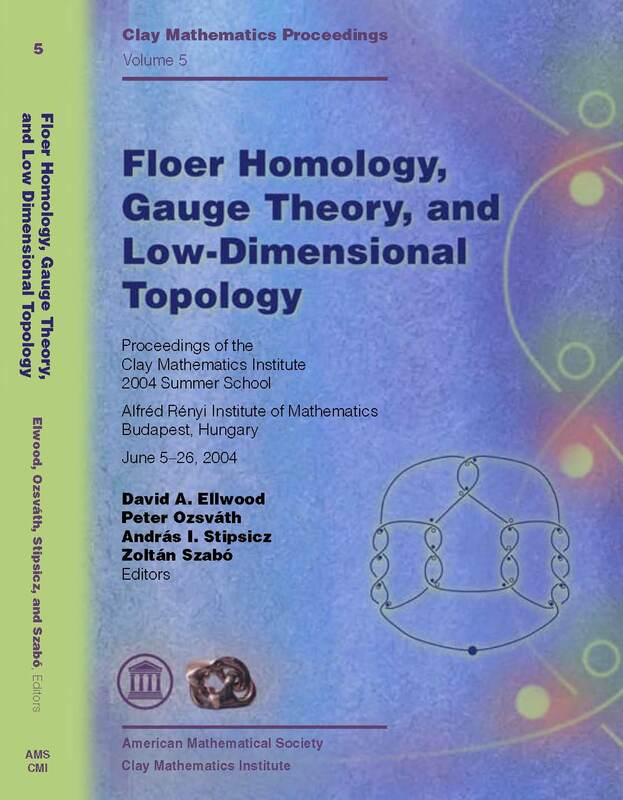 ''Heegaard Floer homology'', the recently—discovered invariant for three— and four—manifolds, comes from an application of Lagrangian Floer homology to spaces associated to Heegaard diagrams. Although this theory is conjecturally isomorphic to Seiberg—Witten theory, it is more topological and combinatorial in its flavor and thus easier to work with in certain contexts. The interaction between gauge theory, low—dimensional topology, and symplectic geometry has led to a number of striking new developments in these fields. The aim of this volume is to introduce graduate students and researchers in other fields to some of these exciting developments, with a special emphasis on the very fruitful interplay between disciplines. This volume is based on lecture courses and advanced seminars given at the 2004 Clay Mathematics Institute at the Alfréd Rényi Institute of Mathematics in Budapest, Hungary. Several of the authors have added a considerable amount of additional material to that presented at the school, and the resulting volume provides a state-of-the-art introduction to current research, covering material from Heegaard Floer homology, contact geometry, smooth four—manifold topology, and symplectic four—manifolds.